Learn about Windows SmartScreen feature in this article. Also read how to enable or disable Windows SmartScreen in Windows 10 using registry manipulation. Many times users download anonymous files from the Internet and try to run it on Windows. If you’re using Windows 8 or later, those files will not run directly, unlike earlier versions of Windows series. The reason behind this is presence of Windows SmartScreen filter. If you select Don’t run option in above message, your system will remain in default state. In case if you know that internal contents of app/file you’re trying to run and you believe that they couldn’t harm your machine, select Run anyway option. 2. In the Windows SmartScreen configuration window appearing next, you can enable or disable this security feature (default is enabled). Once you’re done, click OK.
You may have to restart your machine to make your changes effective. INFO: You can also access Windows SmartScreen configuration window from Control Panel > All Control Panel Items > Security and Maintenance > Change Windows SmartScreen settings. We’ve have observed that sometimes users are not able to change Windows SmartScreen filter settings as mentioned above. This is because the options in Windows SmartScreen configuration window are greyed out (see screenshot below). 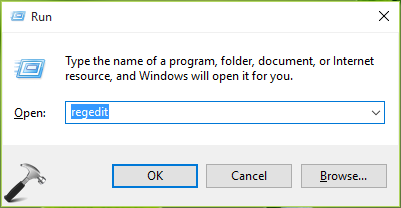 Once you’re done, click OK. Close Registry Editor and reboot. Hope you find the Windows SmartScreen filter helpful! ^^ Please verify if you have the SmartScreenSettings.exe file in System32 folder.